This article is about Ness's appearance in Super Smash Bros. Brawl. For the character in other contexts, see Ness. Ness (ネス, Ness) is an playable character in Super Smash Bros. Brawl. He was confirmed on February 1st, 2008 on the Smash Dojo website. He is once again voiced by Makiko Ohmoto, with mostly recycled voice clips from Melee, while providing some new ones. Ness is currently ranked 26th out of 38 on the tier list, a vast improvement from his placement in Melee, where he was ranked 23rd out of 26 characters. 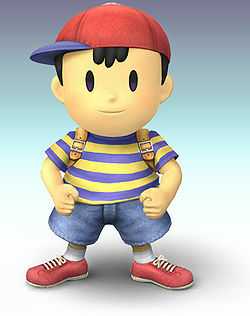 Ness possesses a strong aerial game with very useful aerial attacks, as well as effective tilts, effective throws, a projectile with great trapping and damage potential in PK Fire, a versatile projectile capable of very early KOs and mindgames in PK Thunder, and multiple powerful, reliable finishers (such as his back throw and back aerial). Ness is greatly hindered however, by his limited and easily disruptable recovery, the rather poor reach in most of his attacks, possessing a lackluster set of smash attacks, and by the 10 additional frames of lag he suffers when grab released, leaving him vulnerable to grab release followups from almost every character, as well as infinite and zero to death grab release chain grabs (most infamously from Marth and Donkey Kong, but also Charizard and Squirtle). Ness overall has poor matchups with several counters, and he has had average tournament results. Have Ness join the player's party in the Subspace Emissary (Subspace (Part I)). With the exception of the third method, Ness must then be defeated on Onett. Generalizing Ness is difficult. He generally runs a unique, versatile role, employing three different projectiles with differing purposes. Generally, the moves have modest lag and decent knockback, his PK Fire leads well into other attacks, and his PK Thunder can trap opponents and lead into PK Thunder 2, one of the strongest attacks in the game. Also, PK Thunder and PK Flash both leave Ness very vulnerable because he can't move or attack when controlling these projectiles. Ness can use his PSI Magnet to absorb any energy projectile. The best for Ness, however, are his powerful throws, most notably his back throw, the only throw in Brawl that can reliably KO under 150% without relying on being on the edge and bad DI. Combining these with proper projectile use and appropriate Smash timing, and Ness can be a powerful foe. Shield Grabs tend to be a problem for Ness because of his below average standing grab range. Ness is fairly balanced in the areas of weight, falling speed, and air speed with none of them being particularly good nor particularly bad. Ness' true game can be found by utilizing his aerials. Ness is one of the very few characters in the game who can perform two aerials in one shorthop (Double Aerial Shuffle). This requires practice though because one needs to do the aerial immediately when one jumps off the ground. Looking at his aerials individually, his neutral aerial is fast and a great combo move. His forward aerial can set up into itself, making it good at damage-racking. His back aerial deals powerful knockback when sweetspotted, making it his best aerial finisher, while it can be used for a wall of pain when sourspotted. His up aerial is a very strong vertical KO move with a decent amount of range. Lastly, his clean down aerial is among the best meteor smashes in the game, and when hit late, it has strong horizontal knockback, making it good for edgeguarding. His ground game is decent but not great. With slow dash speed and short range tilts, he suffers fighting people with disjointed hitboxes such as Ike or Marth. The only upside of his tilts are that they come out very quickly, which can be used to rack up damage. His forward smash, although powerful, is slow. His up smash, though weak in terms of knockback, is very versatile when used properly, being one of the only two smash attacks able to damage people while charging, the other being Ness's down smash. All of Ness's smashes also give Ness some much needed range in his ground game. Ness's major problems are his poor ground grab release and recovery. He and Lucas both suffer from having extremely long grab release animations. Most characters have some sort of ground grab release on Ness, and/or Lucas, leading to chaingrabs, infinities in walls, and other moderate to major problems. An example would be Marth's 0-death on Ness and Lucas. Another example is Wario using his forward smash out of the grab release, which Ness can't avoid. As mentioned above, Ness's other major problem is his using of PK Thunder 2 as a recovery move. Although Ness has a very large 2nd jump (second only to Yoshi's in terms of height), his PK Thunder, though faster than Lucas' PK Thunder, has a much wider turning angle, thus requiring more room for Ness to recover than Lucas. Its PK Thunder 2 also travels less distance than Lucas' version. In addition, his PK Thunder will stop in its tracks when it hits most projectiles, walls, or a character. As such, some opponents may take a risk and jump in front of PK Thunder's path to intercept Ness's recovery, giving Ness little to no hope of making it back onstage, which is easier with disjointed moves. However, this is a risky way of intercepting Ness's recovery, due to his recovery move having an extreme amount of knockback, KOing below 50% in most situations, although a projectile could still be used to halt his recovery, especially if it's controllable. Ness's double jump has a unique quality that sets it apart from others in the game. It consists of four PSI flashes that propel him upward. If Ness uses an aerial or air dodge at the beginning of the jump, he will obtain a directional boost depending on the aerial used and if it is used on the first or second flash (his up aerial gives the longest boost, and the boost is longer if activated on the first flash). He can also use his double jump from the ground if the jump button is pressed during lag, which is helpful for starting up aerial combos. Using an aerial will make Ness move up faster, which complies for his slow double-jump and floatiness. After this, he will take a small pause in the air as a "filler" for the frames lost by the faster double-jump. Ness has been greatly buffed in the transition from Melee to Brawl, given that he was one of the worst characters. While he has seen relatively few direct changes compared to other characters, he has nevertheless seen improvements. His aerial game has seen noticeable improvements as his aerial mobility has improved, most of his aerials have less landing lag, his forward aerial while weaker connects more reliably making it a more effective spacing tool and his up and down aerials have more range and are overall more effective KO moves due to the changes to Brawl's mechanics. His recovery while still poor has also improved due to his higher air speed and lower falling speed and the removal of double jump canceling makes his recovery overall more versatile and reliable. He also overall has superior KO power especially when relative to the cast due to his aforementioned up and down aerials benefiting from Brawls universal changes and PK Thunder 2 is significantly stronger making it a much more powerful tool. However, he also received some nerfs the most significant of which being the 10 extra frames added to his grounded grab release animation. This is detrimental for Ness as it makes him vulnerable to inescapable kill confirms and even infinite chain grabs from some characters. His combo potential is also significantly lower due to the introduction of hitstun canceling, the universally decreased falling speeds and the removal of double jump cancelling. He also lost his powerful yo-yo glitch. Overall, he is considered to be greatly improved from his Melee incarnation, but his longer grounded grab release in particular keeps him from moving into the higher tiers. The overall graphics boost from Melee to Brawl gives Ness much more detail. Ness has a new tumbling animation. Ness uses a different voice clip when using PK Fire. Double jump has a different sound effect. Ness' walking speed is slightly faster (0.84 → 0.86). Ness' traction is lower (0.06 → 0.0546), going from the 15th highest to the 24th highest. Compared with the returning veterans, however, Ness's traction is higher, making it easier for him to punish out of shield. Ness dashes slightly slower (1.4 → 1.393). Ness' air speed is higher (0.093 → 0.09588). Ness' air acceleration is higher (0.06 → 0.1). Ness' Jumpsquat is longer (4 frames → 5). As with the returning veterans, Ness' falling speed was reduced (1.83 → 1.31). Compared to the returning veterans, however, Ness falls faster. While this improves his endurance, it worsens his recovery and makes him more vulnerable to combos. Ness' gravity is lower (0.09 → 0.0711). The removal of double jump cancelling greatly hinders his already poor approach and slightly weakens his combo ability, but significantly improves his recovery's safety. Spotdodge has a longer duration (frames 2-18 → 2-20) and less ending lag (frame 28 → 26). Ness' grounded grab release animation is 10 frames longer, which makes him vulnerable to chain grab releases and combos as the entire cast now has a 10 frame advantage when they ground release him (instead of just Bowser who now has a 20 frame advantage over Ness due to this). He is also more vulnerable to aerial grab release followups due to the general changes to aerial grab releases. The third hit of neutral attack has increased base knockback (16 → 40). The introduction of jab locking also improves the first hit's utility. Down tilt is better at racking up damage as it deals more damage (3% → 4%) with reduced knockback (4 (base), 50 (scaling) → 3/20), and has a 30% tripping chance. Dash attack deals more damage due to changes to stale move negation (12% → 13%) and it connects more reliably. Forward smash has more startup (frame 16 → 22) and ending lag (frame 50 → 56). Forward smash now produces a more realistic sound of a bat hitting a baseball instead of using the Home-Run Bat sound effect. His up and down smashes are stronger, have greater knockback and are able to KO at very high percentages (though the former is still among the weakest up smashes, while down smash is now a down smash of average power). They also have a longer duration (frames 12-31 → 13-35 (down), 13-36 (up). Down smash also has less end lag (frame 62 → 57). Both his up and down smash no longer increase in damage or knockback when charging. They also have more startup lag (frame 12 → 13) and up smash has more end lag (frame 49 → 64). Yoyo/Jacket glitch has been fixed. The removal of the Yoyo/Jacket glitch has significantly hindered his already poor range. His yo-yo has gained a new design. All aerials except down aerial have less landing lag (22 frames → 18 (neutral), 18 frames → 12 (forward/back/up)) although due to the removal of L-canceling, their landing lag was not fully compensated. Neutral aerial has increased base knockback (15 → 20 (clean), 0 → 10 (late)). Neutral aerial's sourspot deals 1% less damage (8% → 7%) although its base knockback was compensated. Back aerial has a slightly bigger sweet-spot compared to Melee version. And its sourspot is also much larger, greatly increasing the move's overall range. Back aerial deals less damage (16% (clean), 10% (late) → 15%/8%) hindering its KO potential. Forward aerial's multi hits have reduced knockback scaling (100 → 60) allowing them to connect more reliably. Forward aerial deals much less damage (3%/2% → 2% (loop hits), 5% → 3% (final hit), 15.74% → 11% (total)) although the final hit's knockback scaling was somewhat compensated (135 → 145). It also has less range due to only having one hitbox per hit although it is larger than the previous hitboxes (6.8u/4u → 8.1u (loop hits), 9u (final)). Up aerial has a larger hitbox (5.964u → 7.2u) and has more KO potential due to the universally decreased falling speeds, allowing it to used as a effective vertical finisher. Down aerial is more effective due to the changes to meteor canceling and the universally reduced falling speeds, has much better range (5.452u → 6.54u), making it easier to meteor smash. It also has a powerful sourspot which sends opponents horizontally which can KO grounded opponents earlier. Down aerial's sourspot deals less damage (12% → 9%). Grab range improved, no longer being the second shortest, and dash grab also has better range and a new, faster animation giving it less startup (frame 10 → 8) and end lag (frame 41 → 36). Standing grab also has less startup lag (frame 8 → 6) and Ness now possesses a frame 6 pivot grab which is the fastest in the game. Standing grab has more ending lag (frame 31 → 35). Pummel has less ending lag (frame 27 → 10). Pummel deals less damage (3% → 1%). Back throw now makes the same sound effect as PSI Magnet. The universally decreased fall speeds and changes to hitstun remove up throw and down throw's ability to combo and chaingrab. Ness can now B-reverse all his specials except for PK Thunder. PK Flash activates faster, charges and travels further and deals slightly more damage when fully charged (36% → 37%), but it no longer activates automatically once it hits the ground, hits in a smaller radius and an uncharged PK Flash deals 2% less damage. PK Flash is more blueish instead of green and has a different sound effect. PK Fire activates faster and can trap opponents more effectively. PK Thunder travels in a tighter arc, making it easier to hit himself. PK Thunder 2 has drastically less ending lag, is significantly stronger (60 (base), 70 (scaling) → 83/80), now KOing at around 50% and the late hitbox deals 1% more damage (20% → 21%) with much more knockback allowing it to KO under 100%. The camera no longer follows the ball of lightning as it moves away from Ness. The lightning ball is now indigo instead of blue in color. PSI Magnet heals less damage (x2.0 to x1.6). PSI Magnet now has a push effect when released. Ness now has a Final Smash PK Starstorm. He uses his PK energy to summon multiple meteorites from the sky which each deal 20% to opponents. 3% Ness punches twice, then kicks. 12% Ness kicks with a foot forward. Can be angled. 7% Ness pushes upward with both hands. 4% Ness swiftly kicks out in front of him. Extremely spammable. Has a chance of making the opponent trip. 5% (hit 1), 4% (hits 2-3) Sends three PSI sparks out in front of him with the third spark knocking the opponent up into the air. Each hit sends the opponent in a different direction, with different knockback. Great, disjointed range. If all hits connect, it can be followed up by an aerial combo. 24% sweet, 18% sour Ness swings his bat. There are four hitboxes on the bat, dealing 18%, 20%, 22% and 24% uncharged, the strongest part being at the tip of his bat. The bat will reflect incoming projectiles when he swings it. 4% (startup & charge), 9% (front), 13% (back) Ness sends his yo-yo forward and performs "around-the-world" over himself. Interestingly, when it's 'charging', it doesn't increase in damage or knockback. 4% (startup & charge), 13% (attack) Ness sends his yo-yo backwards and "walks-the-dog" with it before pulling the yo-yo back. Similar to his up smash, the yo-yo doesn't increase in damage or in knockback when it's "charging". 11% (clean), 7% (late) Spins diagonally in the air with arms outstretched. 2% (hits 1-4), 3% (hit 5) Ness sticks out his palms out, sending a stream of PSI sparks in front of him. 15% (clean), 8% (late) Ness kicks out backwards with both feet. If sweetspotted, it electrifies the opponent and semi-spikes them with extreme power. 13% Ness headbutts up into the air. 12% (clean), 9% (late) Ness pulls his legs to his body before stomping down into the air. This attack can meteor smash in the first frame of the move. Somewhat laggy in the startup. — Grabs opponent with both hands. 1% Ness quickly headbutts the opponent. Very fast. 11% Ness psychokinetically swings his opponent in a small circle in front of himself before sending them off forward. 11% Ness psychokinetically swings the opponent over his head before sending them off backwards, in a diagonally upwards motion. Has extremely low base knockback but very high knockback scaling. Has the highest KO potential of all throws. 10% Ness psychokinetically spins the opponent above his head before sending them up. Leads into many PK Thunder tricks and juggles. Good knockback for an up throw, though the opponent will have to be around 200% to actually KO. 1% (hits 1-5), 4% (throw) Ness throws his opponent onto the ground and scorches them with PK Fire. Combined with pummeling and PK Fire, it can be used to rack up a high amount of damage quickly. PK Flash 9-37% Ness generates a green pulse of energy that is sent upwards, then explodes. It can be charged, increasing damage and knockback while causing it to curve downwards, and it can be moved sideways. PK Fire 4% (lightning), 1-2% (fire) Fires a yellow, lightning-bolt shaped projectile, that travels in a straight line until it hits an enemy or destructible portion of a stage, at which point it explodes into flames. When used in midair, Ness fires the bolt at a 45° angle. PK Thunder 2: 25% (clean), 21% (late) Ness creates a stream of lightning that can be aimed into opponents to deal damage with the head and stun with the tail. Aiming the head into Ness himself will launch him in a trajectory opposite to the side he was hit on, which is referred to as PK Thunder 2. PK Thunder 2 has invincibility frames during the first half of the move. PSI Magnet 0%, heals x1.6 the damage of absorbed projectiles. Creates a blue energy field around himself which allows him to absorb all energy-based projectiles. It can be held in order to use it repeatedly. The move pushes nearby opponents when the button is released. PK Starstorm 20% (each star) Ness calls down a rain of stars from the sky, yelling "PK... Starstorm!". Ness teleports onscreen using PSI Teleport, then shakes off the soot gathered after crashing. Up taunt: Ness bows and says "Okay." Ness' Up taunt is a reference to the naming screen in Ness' game EarthBound. When one confirms the name one is giving a character, one hears a sound effect of the game's creator, Shigesato Itoi, say "Ok desu ka." which means "Is that okay?" in Japanese. Side taunt: Ness points his bat outward and says "Huah!" Down taunt: Ness creates PSI sparkles on his fingers while saying "Hah!" Closes his eyes and places his finger to his forehead, similar to Lucas' Down taunt. Frowns and looks around cautiously. Ness Ness Ness OOOO! Ness Ness Ne-su! Ness says "Okay." like his up taunt. Up: He jumps up and down twice, swinging his arms, before quickly nodding twice towards the screen with arms akimbo. Right: He swings his bat many times before holding the bat with his right hand, outstretched and pointing diagonally upwards. Ness has a poor matchup spread overall. He only counters Ganondorf, soft counters 5 characters, and goes even with 8 characters. On the other hand, he gets soft countered by 11 characters, countered by 8 characters, and hard countered by 3 characters. Ness generally struggles against characters who can pull of a Zero-to-Death grab releases on him, most notably Marth and Donkey Kong. FOW - Considered one of the best Ness mains in the world before switching to Meta Knight. Fsann - Japan's top Ness player. Shaky - Considered the undisputed best Ness following FOW's switch to Meta Knight. Ness' standing in the metagame has not changed much. He was originally seen as a low tier character, lying at the low tier at 31st. He did increase to 27th by the third tier list as new Ness professionals were discovered, and he stayed there for every single tier list in Brawl, until the last one, where he was slightly bolstered by one tier. Ness shows up saving Lucas from the giant Pig King Statue, which is soon revealed to be their mutual nemesis, Porky Minch. Lucas and Ness team up to defeat Porky and his machine. Afterwards, Wario attacks him with his Dark Cannon, but Ness successfully dodges each shot. Wario, however, then aims at Lucas, forcing Ness to push Lucas out of harm's way and take the arrow from the Dark Cannon, which turns him into a trophy. As Lucas is too scared to face Wario, he leaves Ness behind as Wario cackles in the rain. Most of Lucas's story in SSE involves getting revenge on Wario and trying to find Ness. As Wario is driving his Cargo with Ness' and Peach/Zelda's trophies on board, he finds Luigi's trophy and prepares to take it until he is ambushed by an army of Waddle Dees, who throw Luigi's trophy into the cargo, which is stolen by King Dedede. At his hideout, Dedede puts a badge on Luigi's, Ness', and Peach/Zelda's trophies before the roof collapses on them, turning Dedede into a trophy in the process, and Bowser takes Peach/Zelda's trophy. Soon afterwards the Ancient Minister detonates a Subspace Bomb that consumes Dedede's castle along with Ness', Luigi's and Dedede's trophies by Subspace. Ness is not seen again until much later in the story, where he and Luigi are revived thanks to the Dedede Badges. Upon inspecting Luigi's badge, he notices that it looks like Dedede, and, assuming that Dedede made them, proceeds to revive him. Upon being revived, King Dedede gives both of them a hug before they team up and rescue Lucas, along with most of the other characters. Kirby, who was revived by the Dedede brooch he swallowed earlier, revives whatever characters that Ness' group did not come across, including Wario. Wario then bashes Dedede in the head as revenge for Dedede stealing his cargo and trophies. He is then surprised to see Ness and Luigi on Dedede's side. They offer to let Wario to join them, and he agrees and rides his bike up to the entrance of The Great Maze. Ness, along with Sonic and the other characters team up to defeat Tabuu. Ness was captured by Wario during The Ruined Zoo, and he is brought into King Dedede's castle after he previously stole Wario's trophy cart. But after The Cave, a Subspace Bomb was detonated near his castle, bringing Ness into Subspace. Event 25: The Aura Is With Me: As Lucario at 182% damage, the player must defeat Sheik and Ness on Spear Pillar. Event 26: The Slow and Easy Life: Ness must defeat three tiny Olimars on Smashville before K.K. Slider's song ends. Event 29: All-Star Semifinal Regulars: Ness is one of the opponents fought in this event. All opponents are characters that were unlockable from the original Super Smash Bros. game. Ness's main and Final Smash trophies can be obtained by clearing Classic Mode and All-Star mode respectively with Ness. An average boy whose life changed when he found a meteor and an alien on a nearby mountain. The alien warned him of a future threat, and adventure ensued. He can use psychic energy known as PSI and also wields a bat and yo-yo. This brave youth gives his all to defeat the evil Giygas. Ness as he calls down a host of damage-dealing stars in his Final Smash. Everyone on the screen must dodge like crazy to avoid getting hurt, but that's no easy task. This attack appeared in the Mother series, but it was Poo, not Ness, who wielded it. Perhaps Poo taught Ness the secret of the attack for use in Super Smash Bros. Brawl. Despite being the first character unlocked through playing Brawls, Ness is one of the last characters unlocked by playing Subspace Emissary. He is also the first unlockable character to be playable in the Subspace Emissary, despite not joining the player's team until near the end of the game. Strangely, Ness has visible teeth during the cutscenes of the Subspace Emissary, but not during the actual gameplay. Lucas has this distinction as well. When in metal form, Ness' bat is also metal, but his yo-yo is not. Ness' yo-yo says "Super Nintendo 2008" along the top, above "MOTHER." Ness and Captain Falcon are the only two characters to have their unlockability status change between Melee and Brawl. Ness is the only fighter to have his trophy list another Super Smash Bros. game for his game appearances. This is most likely due to the fact that outside of the Super Smash Bros. series, he only made a playable appearance in EarthBound. Super Smash Bros. for Wii U instead lists the second appearance as Mother 1+2, released in 2003 for the Game Boy Advance. Ness is the only character to be fought on a Melee Stage (Onett) when being unlocked. Ness is one of the only four unlockable characters to appear in the opening cinematic of Brawl. The three others sharing this attribute are Marth, Snake, and Sonic. This page was last edited on March 14, 2019, at 08:31.